Wikipedia calls a power grid "an interconnected network for delivering electricity from suppliers to consumers." That makes it sound simple. Almost trivial. In reality, our electrical grid is a high-tech marvel that covers a huge geographic distance and contains tens of millions of connections and interconnections. 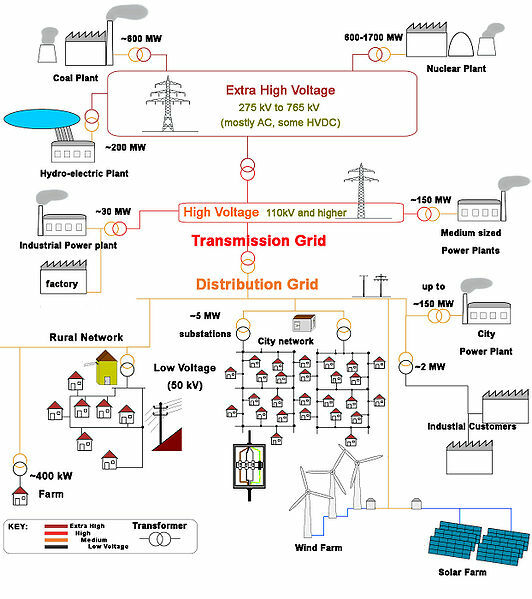 The graphic below shows a simplified schematic for a power grid (it comes from Germany, so there are probably differences in practices/technology here in the US). I'm going to let wikipedia do the heavy lifting describing how a power grid works. In addition to their power grid article, they also have interesting articles on electricity generation, electricity transmission, and electricity distribution. Passing these topics off to Wikipedia leaves space here for specifics about the power grid in New England and in New Hampshire. Today’s power industry is far more than a collection of power plants and transmission lines. Maintaining an effective grid requires management of three different but related sets of flows – the flow of energy across the grid; the exchange of information about power flows and the equipment it moves across; and the flow of money between producers, marketers, transmission owners, buyers and others. Although the reliable operation of the grid itself is nothing to take for granted, I'm especially interested in the operation of the bulk energy markets and in the ISO-NE planning process. I'll cover bulk energy markets in another post and focus here on ISO-NE's plans for the New England power grid. I found two documents on ISO-NE's website that detail the issues facing New England's power grid. The first document is the ISO-NE 2009 Regional Power Plan. This 171 page report, produced annually, details and tracks the 10-year planning and forecasting results for New England's power grid. The second document is a collection of presentations made by ISO-NE at the NECPUC Symposium last May. In this document, there's information about New England's dependence on Natural Gas for electricity generation as well as a good summary of the challenges of integrating renewable energy into the regional power grid. 1) Transmission line capacity - Can New England's power grid move electricity from generation resources to loads (consumers) with minimal congestion and is the transmission infrastructure robust enough to handle unexpected failures with minimal system-wide impact? 2) Adequacy of generation resources - Given the locations of the loads in the system and the available or planned transmission capacity, will there be adequate, well-located, and reliable generation resources to meet the needs of electricity consumers. Also, is the system robust and able to handle down-time due to planned maintenance, equipment failures, fuel supply issues, or other unexpected events? 3) Integration of wind and other variable-output generation resources - Can the power grid operate reliably with the introduction of large amounts of variable-output generation? Wind is a particular problem in this respect, because output from wind-farms is tough to forecast and alternate generation resources can take time to bring online. 4) Implementation of smart grid technologies - Strategically reducing demand during times of peak-load or equipment failure can dramatically reduce costs compared to sizing generation and transmission capability to handle worst-case scenarios. Assuring that the transmission infrastructure can meet New England's needs both today and in the future requires ISO-NE to manage and forecast several variables simultaneously. The introduction of minimum requirements for renewable power generation has added a new dimension to the infrastructure planning problem. It's not enough to assure the power grid can transport electricity from the generation plants to the load areas. Today, ISO-NE has to make sure that the infrastructure will be able to support the correct "mix" of generation resources to meet physical electricity demands as well as these regulatory requirements. As you can see from the above graphics, there are several transmission projects underway or under evaluation in New England that should reduce power grid congestion, improve reliability, and help deliver energy from planned renewable projects. This presentation by Merrill Lynch/Bank of America, discusses the economics and financing of transmission projects. Slide 6 shows some cost estimates for some of the projects listed above. The cost estimate for the NSTAR project (number 3 above) was $275 million, while the Main Power Reliability Program (number 9) is estimated to cost $1.5 billion. Now you know where that "transmission charge" line item on your electric bill comes from. Slide 8 of that same Merrill presentation lists financing details for some other transmission projects. It appears that as with other capital projects, financing costs are highly dependent on how the deal's structured and who bears the risks. For example, the $600 million Neptune project in NY and NJ was apparently financed with all debt at 1.25% over the LIBOR rate (say 4-5% total in 2008). Meanwhile, the $1.1b TrAIL project in PA, WV, and VA was financed with a blended 50/50 debt/equity mix. That means half the financing was at LIBOR+1.875% and the other half cost 12.7%. Apparently, a key to Neptune's low financing cost was a 20-year power purchase agreement that helped minimize the risk to debt holders. The map above shows some proposed high-voltage direct-current (HVDC) projects that are under evaluation in New England. HVDC transmission technology represents the state-of-the-art in moving large amounts of electricity over medium and long distances. It can be used in both over-land and under-sea applications. Many of the proposals listed above will help assure that renewable energy can be carried from places like Canada, New Hampshire, and Maine to population centers in Boston and points west and south. The figure below shows the capacity for wind projects that are currently in the ISO-NE connection queue. Interestingly, the total for proposed new wind capacity for New England is 2.7 gigawatts. That might sound like a lot, but in the US overall, 1.6 gigawatts of wind capacity was installed in just the last three months. In addition to transmission capacity issues, some electricity sources, particularly wind, have output that's variable and tough to predict. Quick-start natural gas fired generators, demand management techniques, and pumped storage resources can provide a good complement to wind. Coal and nuclear generation, while valuable as base-load resources, aren't as good at complementing wind generation, since they take too long to fire-up when wind output is much lower than predicted. Demand management is another topic that's getting plenty of attention in power grid planning. When planners encounter constraints in either generation or transmission capacity, under the old model, the only solution was to build more power plants and transmission lines. But building an infrastructure that's sized to handle the very peak of demand, or the unlikely failure of multiple generating resources, adds lots of cost and may not be the most economical solution. Newer smart grid technologies, along with various existing load management techniques, allow ISO-NE to incorporate demand-management into their planning process. For example, a large industrial user may agree to turn off large power-hungry machinery when called upon to do so. In exchange, this industrial user will receive a regular capacity payment similar to payments that power plant owners receive for agreeing to provide at-the-ready standby power. From a planning perspective, a promise of load reduction can be just as good as a promise to start up a gas turbine generator. The simple example above is just the tip of the iceberg for demand-response and demand management. Equipment is being installed to allow grid operators to automatically control large amounts of load. Also, ISO-NE has implemented market-based approaches to securing demand-response resources. As of summer 2009, ISO-NE had over 1.9 gigawatts of committed demand-response resources (page 43, tbl 4-8). That's more than one and a half times the output from the Seabrook nuclear power plant and it could mean that fewer power plants and transmission lines will need to be built. One last smart grid concept is the use of smart meters. The cost of providing electricity is highly dependent on system-load and thus, on the time of day when the electricity is consumed. It only makes sense to tie the price of electricity to the cost to produce it. With smart meters, electricity consumers will be incentivized to shift their consumption to when it makes the most sense for them. In many cases, consumers will be able to shift demand to night-time, when the system is usually under-utilized. If everyone does this, and if appliance makers build features into their devices to help, peak loads are likely to go down, or at least grow at a much slower rate. In addition to saving money, shifting demand is also likely to reduce pollution because the power plants that run to meet peak demand are often the biggest polluters. For just one example of the potential savings from smart meter installations, consider the state of Pennsylvania. In 2008, a legislative mandate required utilities to install smart meters for all electricity customers. The cost for the meter upgrade will add $12-24 to a customer's annual electric bill. However, the savings from shifting demand to lower-cost periods are estimated at $46 per year. 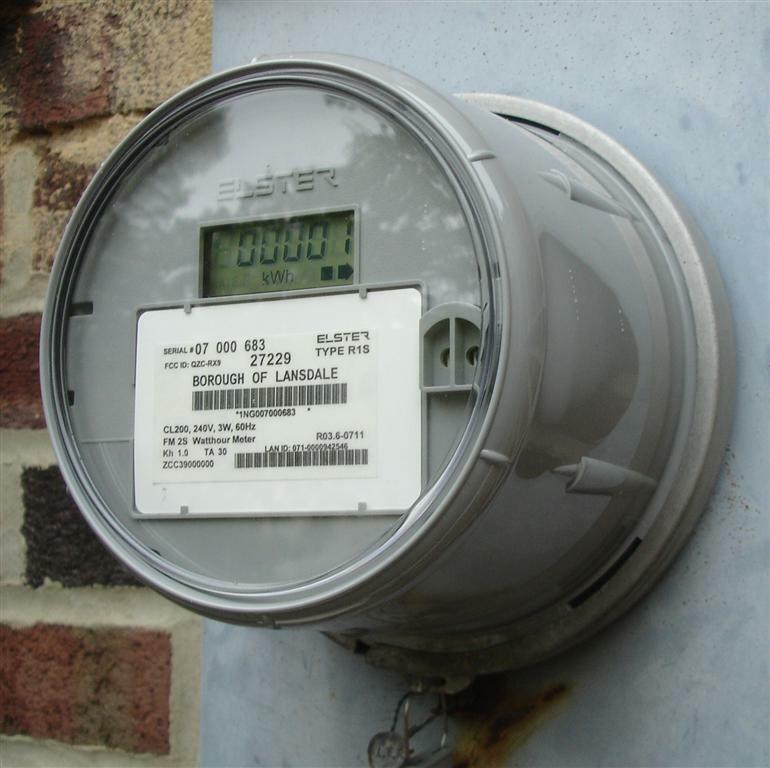 Utilities all around the country are beginning to install smart electric meters. Is New Hampshire ‘smart meter’ ready? I spent today in Concord at the House Ways & Means "Revenue Structure Informational Session," where I learned lots about New Hampshire's tax structure. I was planning on doing a more complete recap, but Grant Bosse of the Josiah Bartlett Center for Public Policy has been live-blogging the event in great detail (Disclosure - although the coverage seems neutral, these folks are fiscal conservatives and oppose any new broad based taxes). IMO, the presentations were jam packed with lots of interesting information. Although a bit of advocacy did rear its ugly head from time to time, overall things were pretty balanced. Also noteworthy was that out of the 7 or so economists presenting, only one favored an income tax. A few of the panelists suggested that a sales tax would probably be the best way to go if a new revenue source was absolutely necessary. But only with the caveat that in exchange, business taxes would be reduced. All the panelists (I think) agreed NH's high business taxes are hurting our economic competitiveness. Apparently, we rank 50th (worst in country) for business tax climate. 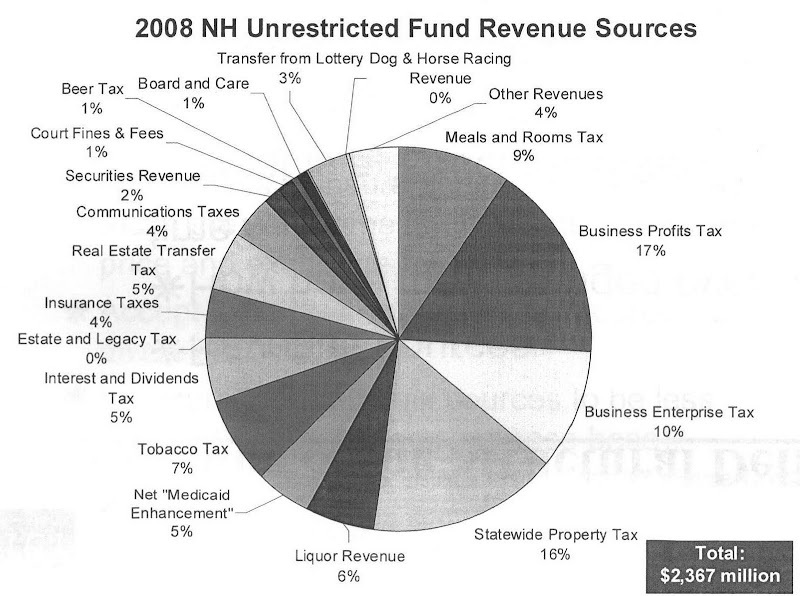 Finally, nearly all the panelists issued a strong warning to the committee that NH's tax advantage has to remain intact or our economic growth trajectory, which is already under stress, will be impacted. I recently read an LA Times news report about new energy efficiency regulations that have been proposed in California for televisions. The draft proposal by the California Energy Commission implies that TV manufacturers are not using the most efficient technologies available and could easily reduce the energy consumption of new TVs by almost 40% by 2013. I was skeptical to say the least. Most new televisions use LCD technology that's an outgrowth of the computer laptop market. Manufacturers of computer laptops have been relentless in their attempts to reduce laptop power consumption to improve battery runtime. If there were any easy LCD power savings available, I was sure the marketplace would have already ferreted them out. Significant reductions in energy consumption can be achieved in Plasma and LCD TVs by adjusting the contrast and brightness screen settings by manufacturers before shipping TVs to the retailers. The power consumption of the TV drops significantly with screen setting modifications. On average, plasma TVs will consume almost 21 percent less power when set to a low power factory preset, sometimes called “movie” or “pro” settings. Ok. Now we're getting somewhere. Apparently, television manufacturers ship TVs to retailers with the brightness max'ed out. This gives their TVs greater showroom appeal. Unfortunately, it also causes the TV to consume more power than needed, and unless consumers lower the brightness once they get the sets home, power is wasted. Now this is news I can use. I decided to test out the theory with our Samsung LCD TV. First, I measured the TV's power consumption with the default factory settings. My trusty kill-a-watt meter showed a reading of 160 watts. Next, I adjusted the brightness to its lowest level. Surprisingly, there was only a slight drop in power consumption, so I returned this setting back to its default. Next, I noticed a "backlight" setting on the TV's display menu. I adjusted the backlight from 5 down to 2. With that, I saw a dramatic reduction in power consumption - from 160 watts down to 116 watts. Given the lighting conditions in the room, this low setting seemed pretty workable. This simple change reduced power consumption by 44 watts per hour. According to Wiki Answers (if it's on the Internet, it must true, right? ), the average American watches over 8 hours of TV per day. This means that the average household could save 128 kW per year of electricity (44*8*365/1000) or around $20. That may not sound like much savings, but when you consider that it's free money, and also consider the reduction in greenhouse gasses from reduced power plant emissions if everyone makes the change, it seems like it could be worth it. Of course, now that we're armed with this new information, we don't have to wait for new regulations to start saving.